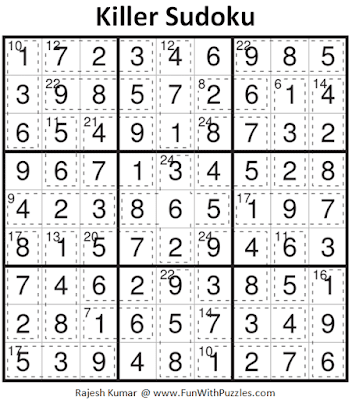 Killer Sudoku puzzle is very interesting Mathematical Sudoku type. You will require some basic Mathematical skills along with strong logical skills to solve Killer Sudoku puzzle. Killer Sudoku puzzle is appearing in 5th round of WPF Sudoku Grand Prix 2018. Killer Sudoku in this Sudoku Competition is assigned very high points. It means that it is going to be very tough. Today's Killer Sudoku puzzle is very tough which I am publishing for the practice of this championship. I am publishing this Killer Sudoku in Fun With Sudoku Series as 342nd Sudoku Puzzle in this Series. My time to solve this Killer Sudoku puzzle is 36.46 minutes. Standard Sudoku Rules apply. Additionally the sum of digits in cells inside every cage must equal the total given for the cage at the upper left cell. Digits do not repeat inside a cage. 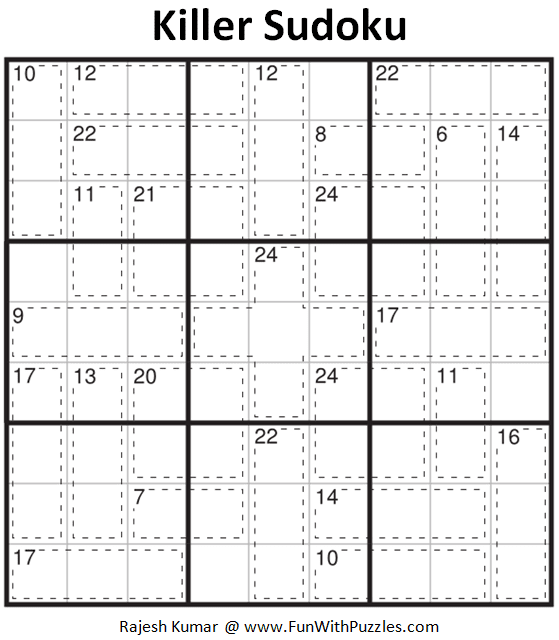 Answer of this Killer Sudoku puzzle can be viewed by clicking on button. Please do give your best try to solve this Sudoku puzzle before looking at the answer. This Killer Sudoku Puzzles I am publishing as #342nd Sudoku puzzle in Fun With Sudoku Series. Here are the next and previous Sudoku puzzles published in this series. Could complete after taking a lot of help, a really tough one. 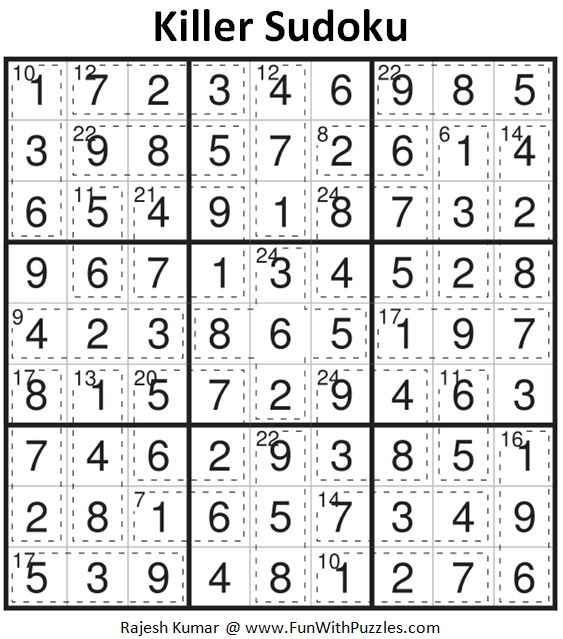 Yes, this one one of the tough Killer Sudoku puzzle which I created recently. This requires lots of calculations to get started. However it can be solved logically without making any guess.